Loving Sai Ram and greetings from Prashanti Nilayam. 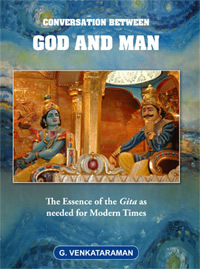 This is my second musings article in the series on the Essence of the Gita. The first was in the nature of a general introduction. From now on, we shall plunge into the Gita and drink as much of its essence as possible. In going through this exercise, I shall not be going sloka by sloka and chapter by chapter. However this does not mean I shall do a random walk across the chapters; by no means. For example, today I shall be dealing with mainly Chapter 2. Whatever I am dwelling upon, I shall generally focus on the main theme of the chapter concerned and try to explain how they all are connected to Mama Dharma; that is because Mama Dharma is the true Essence of the Gita; I am not making this up; that is what Swami has told us. During this guided tour I shall, of course, cite some of the key slokas involved, just to assure you that I have not pushed the Gita proper into the backburner. I hope you get the general idea. Now although this article would deal mostly with the Second Chapter, I simply cannot plunge into it right away; I have to set it up with a brief reference to Chapter 1. As you might be knowing already, the Gita opens with Sanjaya, specially gifted with distant vision, describing to the blind King Dhritarashtra, the father of the Kauravas, the scene in the battlefield in Kurukshetra just prior to the commencement of the battle. As a part of this running commentary, Sanjaya tells the blind king that Krishna who is acting as Arjuna’s charioteer, is taking the chariot to the middle of the battlefield, positioning it right between the two opposing armies. Krishna does this because Arjuna wants Him to. And why does Arjuna want that? So that he could survey the two armies. Looking at the two armies, especially that of the Kauravas, led by the grand-old patriarch Bhishma, Arjuna who till then was itching to wage war, begins to have misgivings. Arjuna tells Krishna that his heart was sinking at the prospect of having to fight and slay close blood relatives, including cousins, uncles, grandfather and his Gurus. Far better it is, says Arjuna, to beg for a living than to win a kingdom by killing one’s near and dear. A crest-fallen Arjuna then lets his bow slip out of his hands, symbolising his reservations and despondency. Krishna then turns to Arjuna and at first reprimands him. Then begins the Divine Discourse that we call the Bhagavad Gita. This reprimand and the Divine teaching commence in the Second Chapter, known as the Sankhya Yoga. By the way, every one of the eighteen chapters is called a Yoga. The word Yoga means union with God; thus every chapter contains some lesson about the road to God. Sankhya Yoga means the Yoga of Discrimination and Wisdom. Arjuna was refusing to fight because his judgement was getting clouded. By what? By ignorance. Why is ignorance having its say? Because Arjuna is not exercising his power of discrimination. What exactly does this discrimination help us to do? It aids us to distinguish clearly between the permanent and the impermanent. Why is such discrimination necessary? Because observing and adhering to Mama Dharma requires us to discharge our duties keeping in mind the permanent and not be fooled by the impermanent, which the world is full of. Incidentally, when I use the word discrimination, what I really mean is Spiritual Discrimination. You might well ask: “Listen, what has all this discrimination business got to do with Arjuna’s basic problem? He did simply not want to fight and kill his grandfather, Guru, etc. Killing one’s Guru, for example, is a pretty heinous crime. That’s why Arjuna did not want to fight. His argument is pretty clear. Where is the lapse in logic, where is the lack of discrimination, and how can one say that killing one’s blood relative is a violation of one’s Dharma? Is it one’s Dharma to kill relatives? What kind of twisted logic is that?” That is the beauty of the way Krishna set it all up! In life, we often face these kinds of dilemmas and we usually choose a path that helps us to avoid difficult options; but in making such a choice, we also often skip the observance of Mama Dharma. It is the collection of such failures that ultimately leads humanity to sink into a morass. We thus see here a beautiful aspect of the Divine Dramatist; He sets up what seems like a black and white situation and makes us mistake black for white and vice versa. Having done so, Krishna tells us, “O man! You are fool! Things are not what they often seem to be. You are deluded because of lack of discrimination. I will tell you how exactly to go about your business!” So that is how the Lord sets up the Sankhya Yoga; brilliant opening, is it not? The crisis or moral dilemma that Arjuna faced related to action. What exactly should he do, confronted as he was with two options, both of which appeared to have their own merits? Arjuna’s dilemma illustrates the problem of making a choice when confronted with difficult options; this is sometimes called Dharma Sankhatam. In life, we frequently have to make a choice amongst many alternatives. For example, while dressing to go to work, you may wonder which shirt to wear; there are many possibilities and you have to make a choice. Fortunately, questions of Dharma do not enter here. However, you may be confronted with a situation where you may be called upon to pay a bribe to get a certain thing done. Should you simply pay up and get the job done quickly or not pay the bribe? If you do not pay bribe or speed money you might have to wait for eternity. Is that OK? Should one just wait forever, for Dharma to work? Whenever there is a choice related to purchase, job selection, etc., the normal procedure followed is one of critical analysis, then evaluation and finally making a firm decision. At the root of it all is discrimination. Everyone must have the ability to discriminate and make the proper choice, be it in relation to family matters, business, or nation building. However, when it comes to matters of ethics and morality, often the choices are not so easy to make. What should one do? How exactly should one proceed? How does one build up this faculty of proper discrimination? What happens if one fails to do that? First, Krishna asks Arjuna to make a clear distinction between that which is permanent and that which is temporary. In modern parlance, one could loosely interpret that as making a distinction between the long-term and the short-term aspects of the problem. Krishna then says that life is a sequence of actions, and before performing any action, we must be careful to make sure it is a proper action. As a first step, one must learn to identify the short and long-term implications. Having identified the two main sorting bins comes now the problem of making a proper choice. For this, says Krishna, one needs discrimination, Spiritual Discrimination to be more precise. The word Krishna uses is Buddhi. How does one bring Buddhi into play? Buddhi would not start functioning just like that. To get it started, one must prepare the ground. That means one must first practice some internal discipline via sense and mind control. Only a person that has his senses and mind under control can think calmly and make a detached judgement. In other words, the Second Chapter is all about proper action, how engaging in right action requires first identifying clearly the options, and then discriminating wisely. The latter would not be possible, unless one practices a certain amount self-discipline via sense and mind control. After this comes a definition of proper action, discrimination, etc. So that is the way we must try and follow the sequence of the ideas. When we do that, we would realise that one way or the other, everything that Krishna says in the Gita relates to Mama Dharma. Let us get back to the basic question: “How do I perform my duty?” The simple answer is: “Always perform the right action.” However, knowing what exactly is the right action is a bit tricky, and that is where the Second Chapter offers an incomparable tutorial. So much for a few invaluable tips about our true nature. Incidentally, we all have heard Swami often raise the question 'WHO AM I?' in many of His Discourses. The next time you hear that, please let your mind go back to the above verses, which contain the answer. The next point; what about the right action or the right duty? In this context, the following sloka becomes very important. We often talk about how selfless Swami’s actions invariably are. That is so, because all actions of all Avatars on all occasions always reflect the true nature of the Avatar, namely the Divinity that the Avatar personifies. This brings us to matter of making the right choice, which is where Buddhi enters the picture. The following are some of the slokas related to the exercise of Buddhi while discriminating properly and making the right choice where action is concerned. The key words in the above slokas are: attachment and equanimity. Let us pause a bit and try to understand what they imply. Attachment is a characteristic of the body-mind combination that is a part of the human personality. The senses, colluding with the mind, make a person go after the attractions of the world. The question arises: “Why do people develop attachments and desires, which the Lord says are not good for man?” This needs a bit of examination. In brief, there are six evil tendencies that humans can be corrupted by. They are Kama, Krodha, Lobha, Moha, Mada and Matsarya (lust, anger, greed, attachment, pride and jealousy). Swami has cited them so many times that I really do not have to add a detailed explanation of these six deadly enemies. These are the six traditional deadly snakes luring inside and waiting to strike. Swami adds two more to the list; they are, ahamkaram and mamakaram, meaning, ego and pride arising out a sense of ‘mine’, which also leads to a kind of possessiveness. Krishna tells Arjuna that all these snakes hide in the crevices, nooks and corners of the mind. How exactly do they operate and how come they are so successful in trapping man? Swami has explained that beautifully. Basically they drag the senses to the outer world, which is full of “attractions”, like gambling, for example. The senses then tempt the mind, which if it succumbs, then leads the body on the wrong path and makes it perform incorrect actions. This being a crucial point, let me go over it slowly and once more. The vices kama, krodha, etc., are like agents or touts. They try to sell various worldly attractions to the senses. The senses which report to the mind – remember, the mind is the boss of the senses – try to make the mind get hooked on to the pleasures and attractions of the world, like gambling, drinking, and so on. Bosses are of two kinds, weak and tough. If the mind acts like a weak boss, it follows the senses into outer world along the treacherous paths sold by the touts to the senses. Then follows disaster. People ask: “Does that mean that senses are bad? In that case, why did God endow man with senses? Is God not being very unfair?” A valid doubt, but at the same time it is the result of superficial thinking. God has endowed not only man but also animals with senses. They too can smell, hear, see, etc. God has endowed living being with senses for survival and protection against dangers in the external world. For example, when a tiger feels thirsty, it can, thanks to its eyes look for water. Similarly, when a deer hears suspicious noises in its neighbourhood, it suspects the presence of tiger nearby. In fact, many animals have very sensitive capacity for smell and can literally smell danger. Thus thanks to the senses, animals can protect themselves against peril. Man too needs similar protection, which is why the compassionate God has given him five senses. The problem is that man misuses the senses for getting attracted to the pleasures of the world. He is not supposed to do that but he does, and that is the starting point of all problems. “Arjuna, know that all the people you are so concerned about are only chariots. They may be grandfathers, or brothers, or cousins; whosever they may be, they are all only chariots. Your vision is clouded because you are all the time looking at and thinking only about the bodies you see. You must instead concentrate on the Indweller who is seated in every body. Then only would your vision become sacred. The unchanging object is the Atma, whereas the external beauties of the bodies and all the thoughts, feelings and behaviours exhibited by these bodies are just images. They are only shadows without real substance. In the Gita, the words that Krishna uses are: Dwelling with the mind on sense objects develops attachments. And as Swami points out, attachments can cloud judgement. So you see, the Lord is not merely giving a command to Arjuna to get up and fight. If all that Krishna wanted was Arjuna to get up and fight, He could have just used a stern tone and commanded him to do so. Yes, Krishna did want Arjuna to fight. However, fighting was not the important part but performing action that was in conformity with Mama Dharma. Krishna being the perfect Teacher, knows how to coax His student. He does this by explaining in full the reason behind His advice. And Krishna does it for a more important reason which is that He wanted the Gita to become the manual of life that would guide all humans at all times along the path of Dharma, so that they can eventually become one with God. I am sure it must have been a heavy dose and so I shall stop here. Next time, I shall continue from where I have left off in this article. I still have a few more things to say about the teachings of the Lord in the Second Chapter. Let me remind you once more that my focus is always on Mama Dharma that Swami says is the essence of the Gita. If you have followed closely what I have discussed in this piece, you would appreciate that Krishna presents His teachings with detailed explanations so that we can clearly understand how they are relevant for all times for all people, no matter where they are.